Dedicated driving is all about stability. As a Dedicated driver, you?ll haul freight each day for a single assigned company or business account from among some of the most recognizable brands in America today. You?ll get to know the people you work with better and will get to make it home more often. With regular schedules and increased stability, Our Dedicated drivers are able to get more out of their lives, both professionally and personally. We utilize state-of-the art technology for safety, sustainability and to keep our drivers connected. Up to 70 percent of our drivers enjoy getting home nightly/weekly. Our fleet consists of late model trucks with an average age of 2 years. We have many opportunities for team drivers and trainers. We offer an extensive and on-going safety training program. 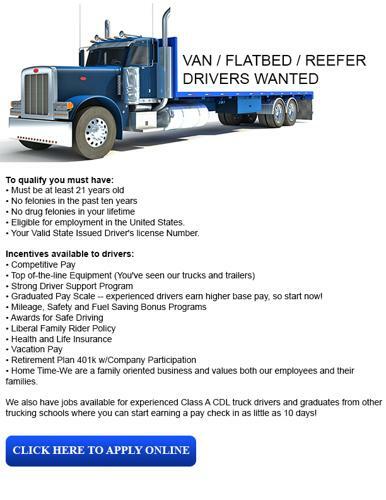 You'll have the option to become an owner operator. We have more than 200 generous pay packages available.